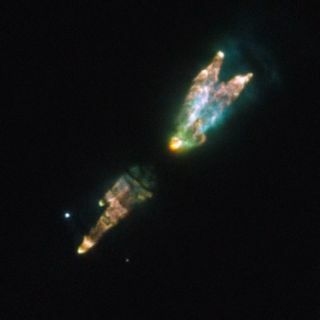 This image from the Hubble Space Telescope shows the Westbrook Nebula. The strange bundle of jets and clouds results from a burst of activity late in the life of a star. As its core runs out of nuclear fuel, the star’s outer layers puff out toxic gases like carbon monoxide and hydrogen cyanide. A dying star has been spotted coughing up a toxic mix of gases in a spectacular new photo from the Hubble Space Telescope. At the moment, the Westbrook Nebula is what scientists call a protoplanetary nebula. As the star at the nebula's heart evolves further, it will turn into a hot, white dwarf. The gas around it will become a glowing planetary nebula, then eventually disperse, researchers said. Planetary nebulas have nothing to do with planets. The term was coined by famed astronomer Sir William Herschel to describe objects that appeared to have circular, planet-like shapes when viewed through early telescopes. Because the protoplanetary-nebula stage is a relatively brief phase in a star's life, only a few hundred of the structures are known in the Milky Way, researchers said. Protoplanetary nebulas are relatively cool objects, and as a result emit little visible light. This makes them very faint, posing challenges to scientists who hope to study them. The image includes exposures in visible wavelengths, showing light reflected from the cloud of gas. These are combined with other exposures in the near-infrared range of the spectrum, showing the dim glow coming from different elements deep in the cloud itself. One of the nebula’s names, AFGL 618, comes from its discovery by a precursor to the Hubble Space Telescope. The letters stand for the Air Force Geophysics Laboratory, which launched a series of suborbital rockets carrying infrared telescopes in the 1970s, researchers said. These observatories catalogued hundreds of objects that were impossible or difficult to observe from the ground. In some respects, the airborne telescopes were a proof of concept for later orbital infrared astronomical facilities, including Hubble and the European Space Agency’s Herschel Space Observatory. This image was prepared from many separate exposures taken using Hubble’s newest camera, the Wide Field Camera 3. Exposures through a green filter were colored blue, those through a yellow/orange filter were colored green, and exposures through a filter that isolates the glow from ionized nitrogen were colored red, researchers said. Images through filters that capture the glows from singly and doubly ionized sulfur are also shown in red. The total exposure times were about nine minutes through each filter, and the field of view is approximately 20 arcseconds across, researchers said.